Écoutez votre livre audio sur des téléphones et tablettes Apple (iOS) ou Android. Faites un essai avec le livre audio de votre choix. C'est gratuit et vous pourrez le garder. Après 30 jours, vous en recevrez un autre tous mois pour $12.99 CAD seulement. Résiliez à tout moment. *Les résidents québécois bénéficient de 2 livres audio offerts lors du premier mois au lieu d'un essai gratuit. 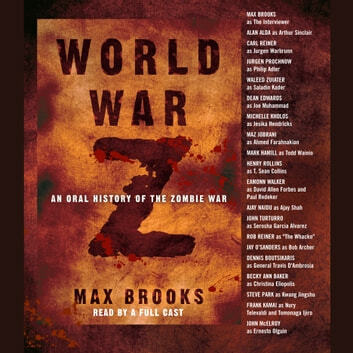 The Zombie War came unthinkably close to eradicating humanity. Max Brooks, driven by the urgency of preserving the acid-etched first-hand experiences of the survivors from those apocalyptic years, traveled across the United States of America and throughout the world, from decimated cities that once teemed with upwards of thirty million souls to the most remote and inhospitable areas of the planet. He recorded the testimony of men, women, and sometimes children who came face-to-face with the living, or at least the undead, hell of that dreadful time. World War Z is the result. Never before have we had access to a document that so powerfully conveys the depth of fear and horror, and also the ineradicable spirit of resistance, that gripped human society through the plague years. Ranging from the now infamous village of New Dachang in the United Federation of China, where the epidemiological trail began with the twelve-year-old Patient Zero, to the unnamed northern forests where untold numbers sought a terrible and temporary refuge in the cold, to the United States of Southern Africa, where the Redeker Plan provided hope for humanity at an unspeakable price, to the west-of-the-Rockies redoubt where the North American tide finally started to turn, this invaluable chronicle reflects the full scope and duration of the Zombie War. Note: Some of the numerical and factual material contained in this edition was previously published under the auspices of the United Nations Postwar Commission.